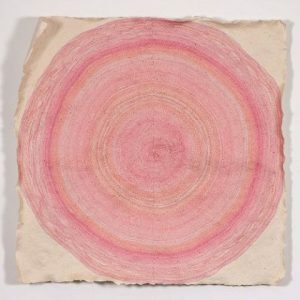 —for Autobiography of Alice B.Toklas/Testimony Against Gertrude Stein, 2011 (ink on handmade paper, coated in pulverized rose petals) by Diane Samuels. Image courtesy of the artist and the Pavel Zoubok Gallery. Featured in the Woskob Family Gallery “Summer Reading” Exhibition, Jun 14 – Sep 8, 2018. I love hearing you read. I am struck by how complex the thoughts are that lead to the comparative (deceptive) simplicity of the beauty produced by the poem. Steven — Thanks for spending some time with Samuels’ artwork, my words, and to share your own thoughts on this pairing. I had fun creating the poem and am glad its creation story added revealing layers to it. I appreciate your comments!